London, July 2017: The Ritz London will once again be keeping the magic of Christmas dreams alive with a programme of spectacular celebrations and events during this year’s festive season. The hotel’s palatial exterior and opulent Louis XVI interior décor will be sprinkled with sparkle overnight on Friday 24th November 2017. The centre-piece of the transformation is a Nordic pine Christmas tree, standing 25 feet tall, grown especially for The Ritz in the Scottish Highlands. Located in the hotel’s Lobby, the iconic Christmas Tree is dressed in a traditional red and gold colour scheme with shimmering baubles, opulent angelic cherubs, gold reindeer heads, gigantic red velvet bows, silver tea pots and twinkling lights that tower up through the rotunda extending to the hotel’s first floor. 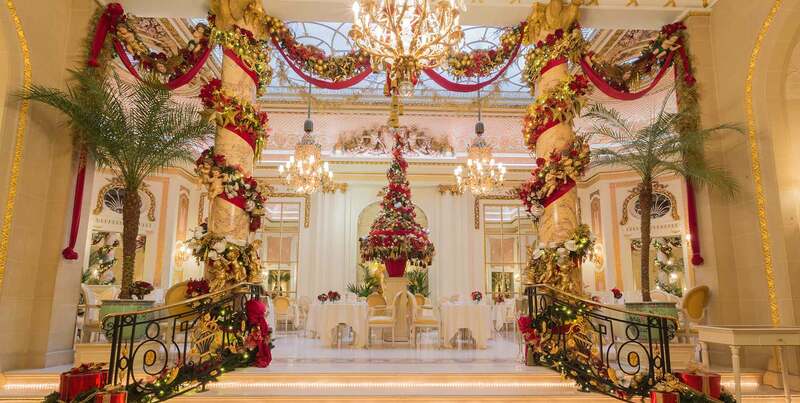 Renowned for its noble and elegant Christmas spirit, the stunning display will continue through the hotel’s Long Gallery, which will be flanked by smaller pine trees and garlands leading to The Ritz Restaurant, where magnificent wreaths will beautifully adorn the windows leading the eye to the decorated Christmas trees on The Terrace. Little of the hotel will remain untouched by the festive spirit as the decadent decorations also extend into the 18th century private dining rooms in the adjoining William Kent House. Last, but not least, each of the 136 rooms will have a poinsettia and every suite its very own Christmas tree creating a wonderful and welcoming atmosphere, to delight both parents and children alike. Under the expert guidance of Executive Chef John Williams MBE, this August the hotel’s brigade of Chefs will prepare the 2017 collection of 150 limited edition Ritz Christmas Puddings, exclusively for sale at the Christmas Concierge priced at £35 per pudding and available from Monday 27th November. Each individually created Christmas Pudding is accompanied by a numbered authenticity certificate, making a unique Christmas gift. The proof really is in the pudding! Festive dining at The Ritz provides a spectacular occasion, and the talented team of Chefs conjure up a glorious menu of culinary creations. Within the gilded Palm Court, traditional Afternoon Tea is given a subtle yuletide twist, and guests are treated to carol singing by The Ritz Choir. The Traditional Christmas Afternoon Tea includes a glass of Champagne (or Ritz teddy bear for children), and is available between 25th November and 30th December at 1.30pm, 3.30pm, 5.30pm and 7.30pm, priced at £80 per adult and £50 per child. The Ritz Restaurant, considered by many to be the most beautiful dining room in the world, features pink marble columns, ceiling frescoes, gilded neoclassical statues and spectacular garland chandelier. Executive Chef John Williams MBE always uses the best of British seasonal produce and from 16th December guests may indulge in Traditional Roast Norfolk Bronze Turkey with Chestnut Stuffing, carved from the tableside silver trolley. Christmas Eve Gala Dinner and Dance presents a five-course menu with live band entertainment. £325 per adult, £150 per child. Christmas Day Luncheon offers a six-course menu, with live entertainment from the Wandering Hands, as well as a visit from Father Christmas, a magician and a caricaturist all to entertain the younger visitors. £450 per adult, £200 per child in The Ritz Restaurant or £390 per adult, £190 per child in The Music Room. Christmas Day Dinner and Dance presents a four-course menu with live band entertainment. £325 per adult, £150 per child. Boxing Day Luncheon consists of a four-course menu with pianist and singer duo. £115 per adult, £60 per child. Boxing Day Dinner and Dance presents a four-course menu with live band entertainment. £150 per adult, £75 per child. New Year’s Eve at The Ritz guarantees a stellar soirée. The splendidly opulent Ritz Restaurant will provide the backdrop for an elegant black tie Gala Dinner featuring a six-course menu, inclusive of half a bottle of Krug Champagne, live music, and a 14-piece military marching band, Lone Piper and a spectacular firework display on The Terrace to herald the New Year. £1,500 per adult, £750 per child. For one night only, The Palm Court will be transformed into a beacon of revelry, departing from its usual incarnation, and stage a glamorous 1920’s themed black tie four-course dinner, with live music from Elle and The Pocket Belles, who will transport guests to the glamour of the Hollywood Golden Age with vintage swing. A 14-piece military marching band and a glass of Krug Champagne at midnight completes the celebration. £895 per adult, £445 per child. London’s New Year’s Day Parade begins on The Ritz’s doorstep on Piccadilly at noon, with a procession of marching bands and decorative floats. Inside the hotel’s revolving doors, The Ritz will celebrate the first day of 2017 with a New Year’s Day four-course luncheon in The Ritz Restaurant with pianist and singer duo, £115 per adult, £60 per child, and a four-course dinner and dance with live entertainment from Peter O’Donnell and his band, £150 per adult, £75 per child. For further information or to make a reservation for any of the events, please telephone our Festive Reservations on +44 (0)20 7493 2370 or email [email protected].